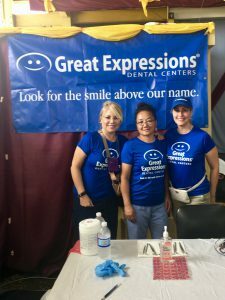 (Sept. 12, 2018) – Great Expressions Dental Centers dentist Dr. Catalina Carrillo, along with Senior Practice Administrator Rosalba Colls and Expanded Dental Assistant Jennifer Hoo recently offered dental care services to students at Dinthill Technical High School and Guy’s Hill High School in Linstead, a rural Jamaican city in St. Catherine. Over the course of two days, Dr. Carrillo, Colls, and Hoo provided free dental services to over 1,300 students. This opportunity was put on by the Dinthill Technical Past Students’ Association’s Florida alumni chapter. The two-day health fair is aimed at alleviating the cost of back-to-school medical and dental health screenings for parents and benefits students. Services at the health fair, which featured 62 medical professionals, included vision and blood pressure testing, teeth cleaning, vaccinations, and much more. A long-standing patient of Great Expressions, who serves as a member of the Dinthill Technical Past Students’ Association, introduced the organization to the program. Throughout the year, Great Expressions professionals participate in initiatives and donation opportunities to better the communities they are privileged to serve, as well as communities around the world. For nearly 40 years, Great Expressions Dental Centers has been a leader in preventative dental care, orthodontics and specialty care with offices in Connecticut, Florida, Georgia, Massachusetts, Michigan, New Jersey, New York, Ohio, Texas and Virginia. Great Expressions is consistently recognized for contributions to improving oral health through quality and safety initiatives, affordable dental care services, patient convenience, research and more. Great Expressions Dental Centers branded practices are independently-owned and operated in specific states by licensed dentists and their professional entities who employ the licensed professionals providing dental treatment and services. ADG, LLC provides administrative and business support services and licenses the Great Expressions Dental Centers brand name to independently-owned and operated dental practices. ADG does not own or operate dental practices, or employ the licensed professionals providing dental treatment and services. For more information, please visit www.greatexpressions.com.